Agave lophantha 'Quadricolor' is a gorgeous, small growing succulent native to Mexico. Growing to no more than 60cm height and 60-100 cm wide it is a surprisingly tough specimen. Pot grown specimens tend to grow no more than 30 cm in height and 30-45 cm wide. Despite its size Agave lophantha 'Quadricolor' is capable of withstanding temperatures as low as - 10 degrees Celsius! In fact there are reports of them surviving even lower temperatures however the condition that there in afterwards was not mentioned. 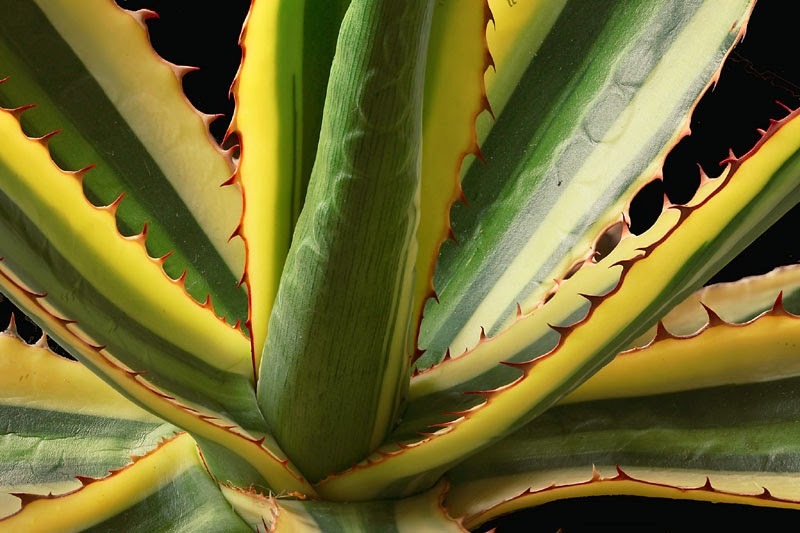 Commonly know as the Quadricolor Century Plant, it produces dark green leaves up to 8 inch long, each one edged with yellow and a pale green mid-stripe. As a contrast the yellow marginal stripes are highlighted by dark reddish teeth, which will also flush red when grown in conditions of bright light giving the leaf four distinct colour zones. It will take several years for Agave lophantha 'Quadricolor' to bloom Flowering beings with the emergence of a tall green stalk which can reach 4 metres tall in will specimens. The top of the stalk produces greenish-yellow flowers and with most Agaves, each plant will only flower once, after which it will die soon afterwards. In northern European climates, plant Agave lophantha 'Quadricolor' in either full sun or bright, filtered light. In warmer temperate regions or even sub-tropical to tropical conditions it is best to keep them sheltered from the full strength of the summer sun. Like most other agaves, Agave lophantha 'Quadricolor' will need to planted in a well-drained soil. If you can provide it, low nutrient, sandy soils will provide ideal conditions. They will tolerates dry conditions but will grow much faster with regular watering over the summer irrigation. Reduce watering over the autumn and then just keep moist, allowing the top couple of inches to soil to dry out before watering again. Keep it too wet and you are at risk of losing your plant from fungal root rots. 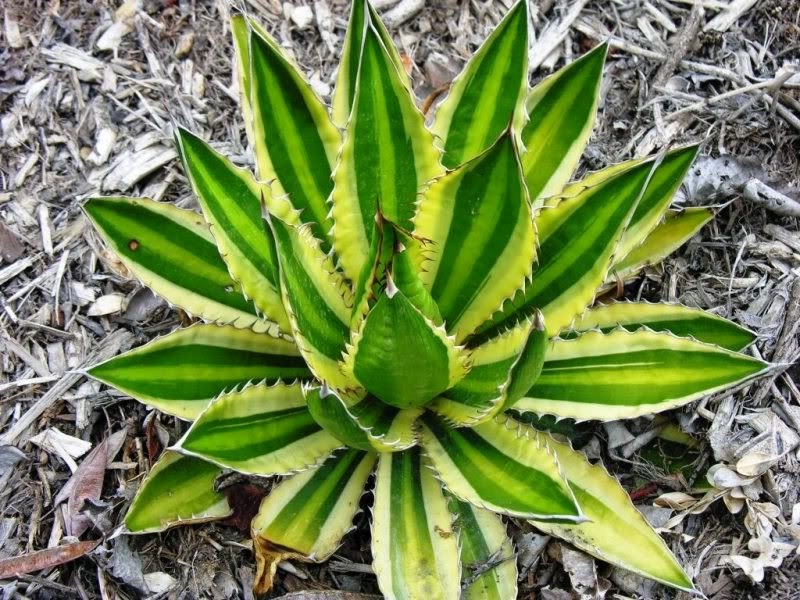 You will not need to feed Agave lophantha 'Quadricolor' as you would regular garden plants, in fact doing so can deform its habit and soften the leaves making them prone to insect and fungal damage. Be that as it may you can feed once every few weeks over the growing season with a low nitrogen fertiliser, or half dose regular fertiliser. Pot grown specimens should be planted in a good quality potting compost such as John Innes No.2, although you can consider mixing additional horticultural grit or sand to improve the drainage further. Use preferably a porous terracotta pot when potting up, one that is no wider than 12 inches. Any wider and you may encounter problems when moving the plants to make the most of the seasonal temperatures due to its weight. Over the summer place pot grow specimens outside in a sunny position, but one once they have been hardened off for a week or so. In the winter, bring Agave lophantha 'Quadricolor' back into a protected environment once temperatures start to drop below 5 degrees celsius. Propagation is from offsets from the base of the plant.